Discover something new and get even more out of your subscription. But if you ended up here trying to find out more about this unlimited audiobook subscription, then let me tell you a bit about it first. Audiobook readers who prefer other genres than Romance might think Kindle Unlimited is the better binge listening choice for them. BUT…. Kindle Unlimited has – among all its genres – around 2000 free audiobooks. That’s not bad and can keep you busy for a while. 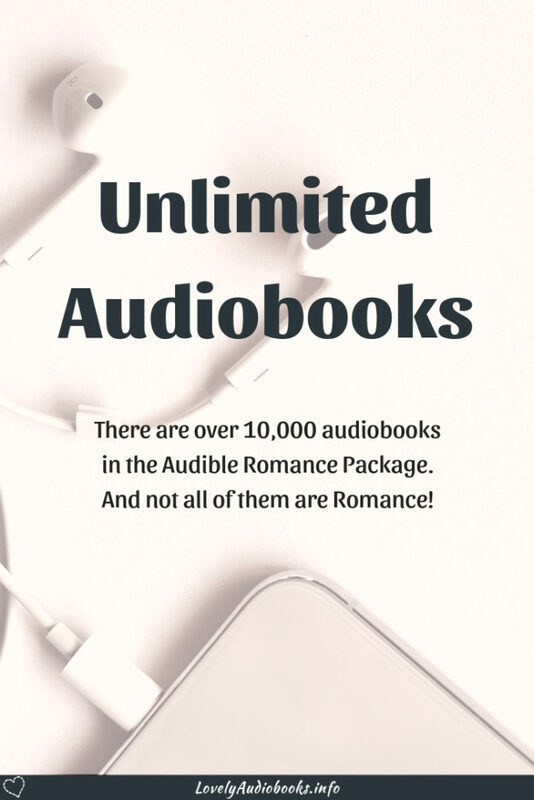 But the Audible Romance Package has over 14,000 free audiobooks! You might not consider yourself (primarily) a Romance reader. But if you don’t mind some love in your books, the Romance Package can still be a great deal for you. There are simply so very many audiobooks to choose from. 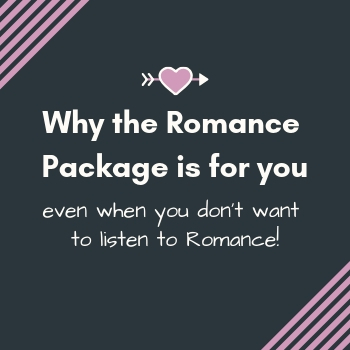 And the price and choice are just two of the reasons why I love the Audible Romance Package so much. So, today I’d like to introduce you to audiobooks in Audible’s binge-tastic Romance Package that aren’t actually first and foremost Romance novels. Now, book genres, just like music, are fluid and can be argued over. In the end, a book belongs to the genre the author intended it for and adds it to on Amazon. But Goodreads is very helpful here since it gives the readers a choice which genre they see the book in. For the following list, I used Goodreads results in addition to the genre on Audible. I’m turning into a bit of a cozy mystery fan and was so happy when I found some in the Romance Package. Audible lists 17 cozy mysteries in the deal. But the ones below are from the category “Modern Detectives” which has 96 audiobooks. If you love this genre, check out more of my recommendations for cozies. Audible lists 38 audiobooks in the category Fiction > Chick Lit for the Romance Package. There’s a bit of a grey area between this genre and Romance of course. And many books listed in Contemporary Romance are arguably more Chick Lit than Romance, because they focus solely on the heroine and her story. But these three books are good examples that Goodreads also considers Chick Lit. Oh yes, the literature is real! There are 26 free classics in the Romance Package to make you feel well read. Chick Lit and classic Romance novels might have you think that I’m really just messing around here and that it’s all just Romance anyway. But you can also find 24 Horror audiobooks in the Romance Package! Of the 506 Teen audiobooks in the Romance Package, most are Young Adult romance. That is to be expected I suppose. But there is also classic YA literature (most notably the Anne of Green Gables series), Science Fiction, Fantasy, and Thrillers. In the category Fiction > Gay & Lesbian, 541 audiobooks are in the Romance Package. Many of them are, of course, romance, just like in the Teen category. But you can also find Crime, Mystery, or Fantasy novels. First i’ve gotta see if i like audiobooks xd BUT this got me interrested! yes ! I so agree on that. I’ve been thinking about trying the Romance bundle but I don’t feel like I am a consistent audiobook listener. I currently have Scribd so I can try to listen to audiobooks but I mostly use it to read books. I’m excited to see the variety of content in the package it makes me very excited to give it a go! That’s interesting that you can find other genres in a Romance package. I might have to check some of these out (not the horror – I’m a chicken LOL!) Great list! Lots of romance. I don’t think that it’s for me though. So true that romance mixes in. I just read a crime thriller where there was an element of romance for a couple of characters. The Undead and Unemployed cover is so cuute. It sounds interesting too! Romance and YA are mainly what I listen to when it comes to audiobooks, but I’ve been looking into trying a fantasy novel or thriller. I’m getting into cozy mystery now 🙂 Fantasy is such a wide field. Fantasy Romance is great, too! Romance is in deed everywhere – thanks for sharing! There’s a lot of cross over in a lot of genres. Romance is definitely one that comes up a lot across the board. Thanks for sharing. It’s interesting how much romance comes up in other categories!